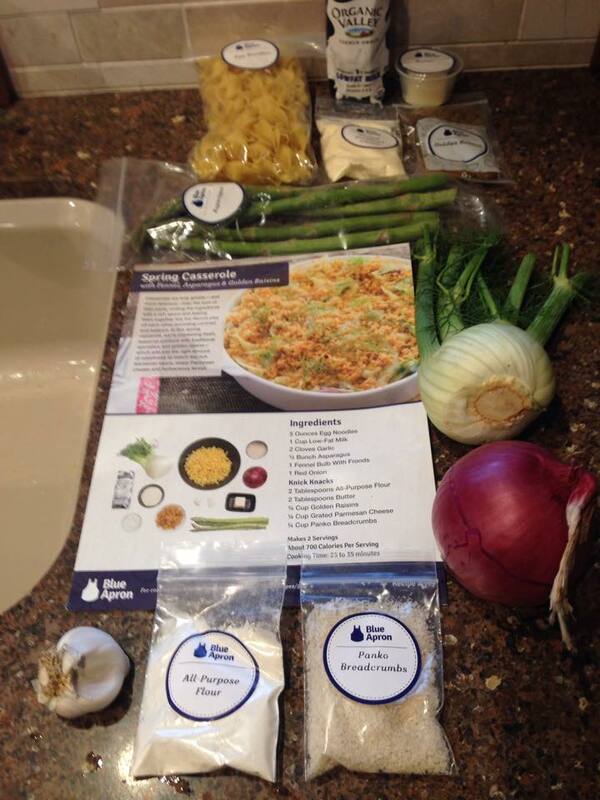 Inspired by the posts of friends, I signed up for the Blue Apron meal kit delivery service. I don’t cook, but I can follow directions and assemble kits so I thought I’d give it a shot. My first attempt didn’t look much like the picture (because I forgot to refer to it before I shoveled the food onto the plate), but it tasted pretty darned good. Rich (my husband) concurs, and trust me, he wouldn’t hesitate to tell me otherwise. I only suffered one injury (need a little more practice with the zester), which isn’t bad considering I repeatedly tempted fate with knives and hot olive oil. But damn, what to do with all of the packaging? Definitely not earth-friendly, which is ironic because today is Earth Day. Shipping box? Recycle. Ice packs? Reuse and Freecycle or donate after the first week or two. But what about all of the little plastic zip-lock bags? And the huge foil insulated bag? 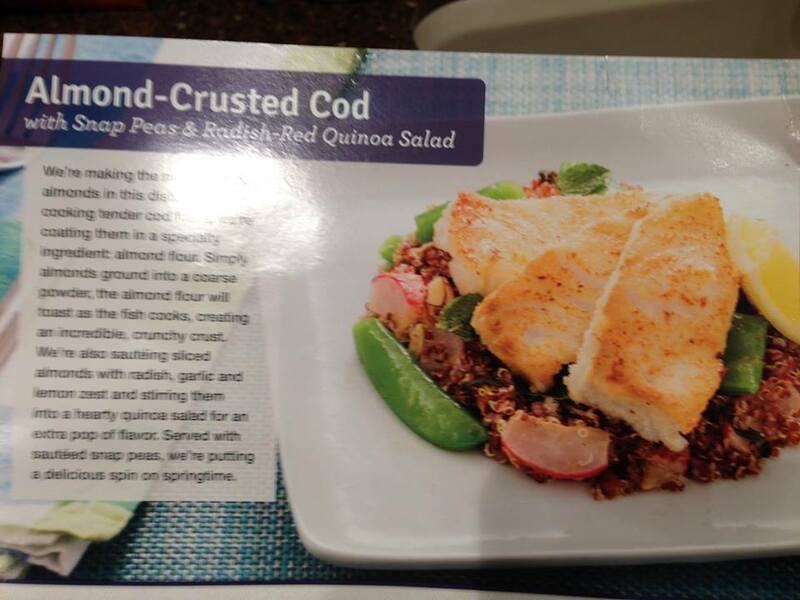 I finally found the Blue Apron recycling guide. Not perfect, but better than nothing. 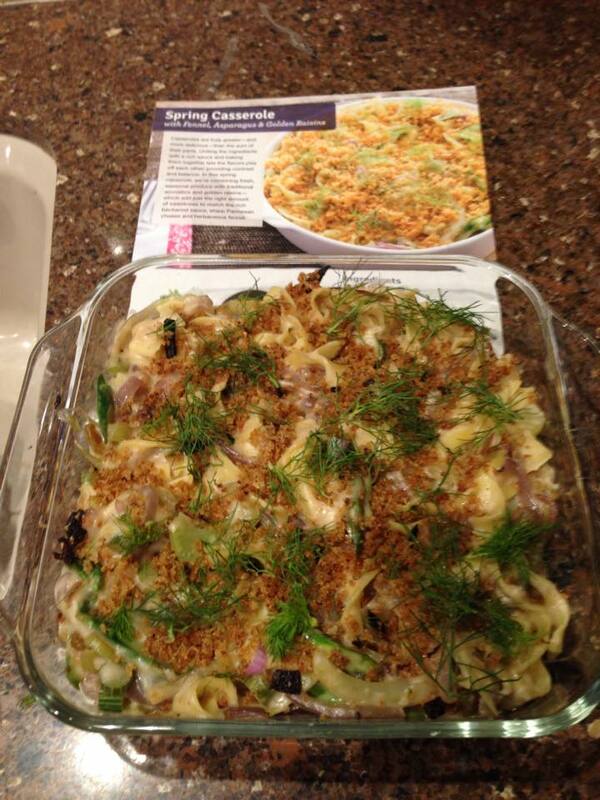 Until about an hour ago, I had never cooked a casserole, had no idea what fennel was (let alone that it is disturbingly reminiscent of “Wilson” from Castaway), and didn’t know that béchamel sauce was even a thing. But here it is, the before and after pic of tonight’s Spring Casserole with fennel, asparagus, and golden raisins (in béchamel sauce). Hm, I took the first bite in the kitchen assuming it would need more salt. It doesn’t. I want to summarize the results of week 1. Aside from lack of passion, there are many reasons I don’t cook: (a) I have no imagination for ingredients and no idea what to do with them; (b) I don’t want to buy a 16-oz bottle of X because a recipe calls for 1 tsp; (c) I’m terrible at planning, making decisions, and shopping – grab ‘n go at Trader Joe’s or Oliver’s is so much easier. Blue Apron probably won’t overcome my overall apathy for learning this skill, but it has addressed the other problems I mentioned. We’re expanding our food horizons. In addition to the fennel example I posted earlier this week, we have this: Rich and I both hate radishes. Raw, that is. Until this week, neither of us had any clue that they were good for anything other than garnish or things to pick out of your salad. 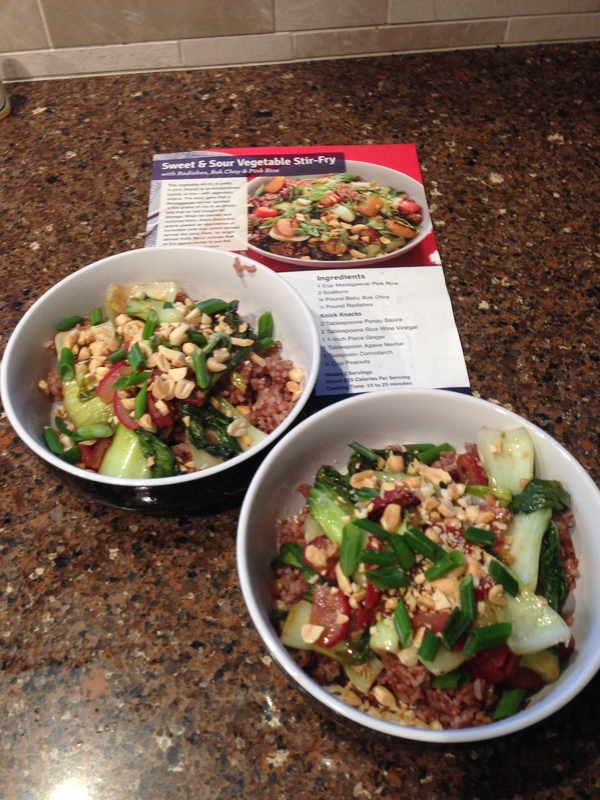 Now I know how to cook them, and surprise, we like them! Tonight, I learned how to recover from mistakes. Mistake #1: When step 1 of the recipe is to simply cook rice, just use the rice cooker so you don’t have to worry about that timing while you prepare the rest of the meal; Mistake #2: 1/2-cup isn’t the same as 1/4 cup (time to fix those glasses), especially when you’re adding the ponzu/cornstarch/water mix to the final phase of the stir-fry. Solution: throw the excess stir-fry goop into the rice that wasn’t quite timed right and turn it on High. Inspired by a friend’s question, we are not only keeping the recipe cards, we are rating them so that we can decide which ones are worth repeating in the future. 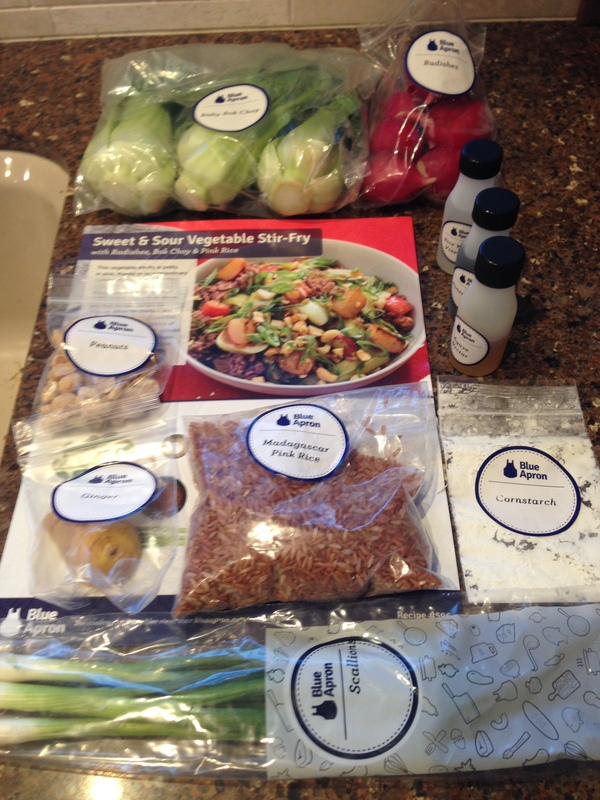 This entry was posted on Monday, April 27th, 2015 at 6:12 pm and is filed under Blue Apron - Learning to Cook. You can follow any responses to this entry through the RSS 2.0 feed. You can skip to the end and leave a response. Pinging is currently not allowed.